After an era of going bigger, stronger and faster the world seems to be captivated by the term ‘downsizing’. 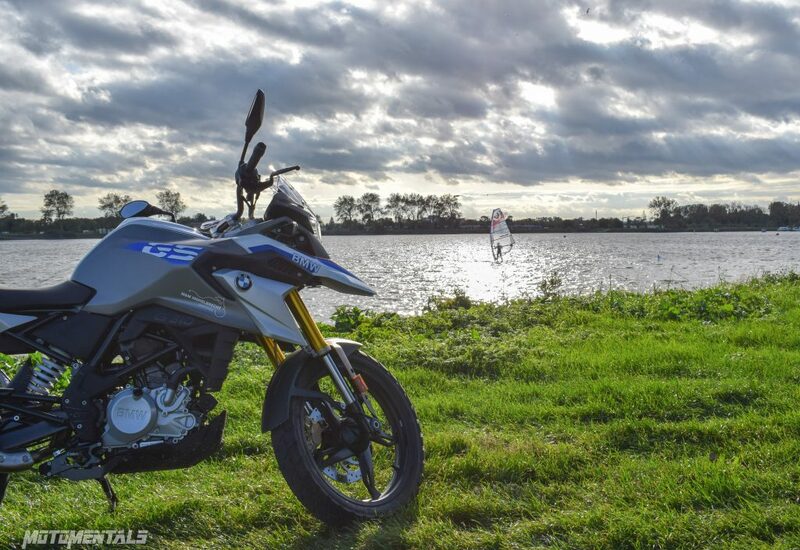 With the release of the BMW G310GS it is time for me to find out why. As an enthusiast of riding big bikes in the dirt, I found myself extremely curious about this new ‘baby’ GS as modern press likes to call it. The opportunity to ride one for two days carte blanche without conditions was given to me by M&M Inghelbrecht in Ostend, Belgium. Marc handed me the keys, showed me how the minimalist dashboard works, how to turn off the ABS and then waved me goodbye with only, “Have fun! Don’t bother coming back today.” as a last salutation. I dived into the city traffic first, just to get the hang of it. The 313 cc engine purring beneath me with sufficient power to get around town. Immediately it gets to me that this GS makes me more of a daredevil in heavy traffic than my own. Squirming myself and the bike in the tiniest gaps in traffic jams just feels natural, as if I’ve never ridden anything else in my life. Sprinting from one traffic light to the next, I can see why many opt for a smaller displacement bike as a daily commuter in the larger cities. At first I fail to balance it on the spot as long as I can with my GS but swiftly I get the hang of the different weight balance and there is no need any more to get a foot down when I have to wait for the traffic to get moving. For me, the clutch is heaven on earth, there are few motorcycles where I can pull the clutch with only two fingers but this is one of them. This is a big advantage during technical riding and city traffic. As always, people and cars in heavy traffic tend to get on my nerves in a jiffy so I decide to get out of there like a bat out of hell and try the highway. 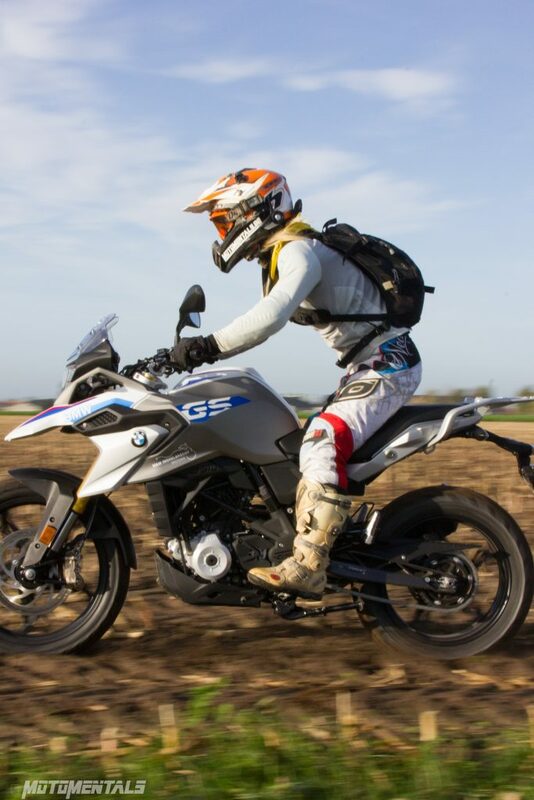 I have no big expectations about the performance of the G310GS on the highway because I remember the riding experience with my F650GS Dakar all too well. Yet, the small displacement bike does reach 105 km/h or 62 miles/h quite fast if you keep it above 7.000 rpm. Official specifications say it should reach 143 km/h or 88,8 miles/h but I only got to 136 km/h or 84,5 miles/h and did not keep this pace up for a long time. It was clearly noticeable that the engine did not like that as much as I did. It felt most comfortable to ride it, qua vibrations, driving wind and still having some power left to overtake at 110 km/h or 68 miles/h. Worth mentioning, you can ride this bike on the highway but this should not be your main goal of using this motorcycle. The idea behind this motorcycle is to have fun and if by occasion you have to ride 50km or 30 miles of highway towards that fun, it’s possible. Getting to my part of having fun or my daily adventure, it is getting my bikes off the pavement. With the rise of the modern mini adventure bikes, and most of the people I know praising the downsizing part of it, I was anxious to know what exactly is so fun about these motorcycles? When I got off the highway in France, I took the bigger secondary roads towards Flanders again (my province, not my neighbor). I got bored as hell. Riding in sixth gear around 90km/h or 55 miles/h on straight roads, nope that was not my thing with this motorcycle. Then again, this bike has been built for making fun, and what makes riding fun? Right, curves. I hit the small country roads and started riding differently. Sitting more to into the front of the motorcycle, my legs wrapped around the small fuel tank and hitting the powerband. 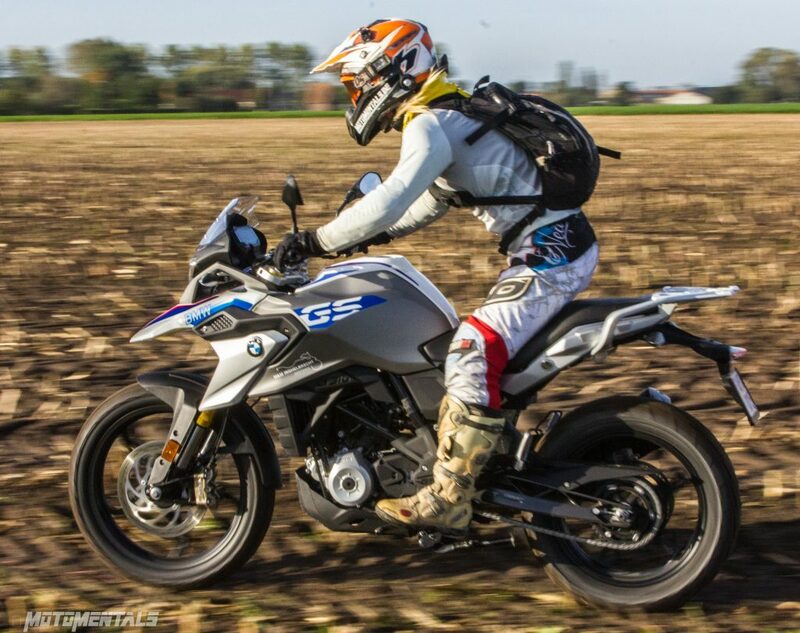 The G310GS transformed into a whole different creature, even supermotard style. To keep the rpm in and around 7.000 – 9.000 rpm, you have to play with the gears and soon I found harmony with the small engine. 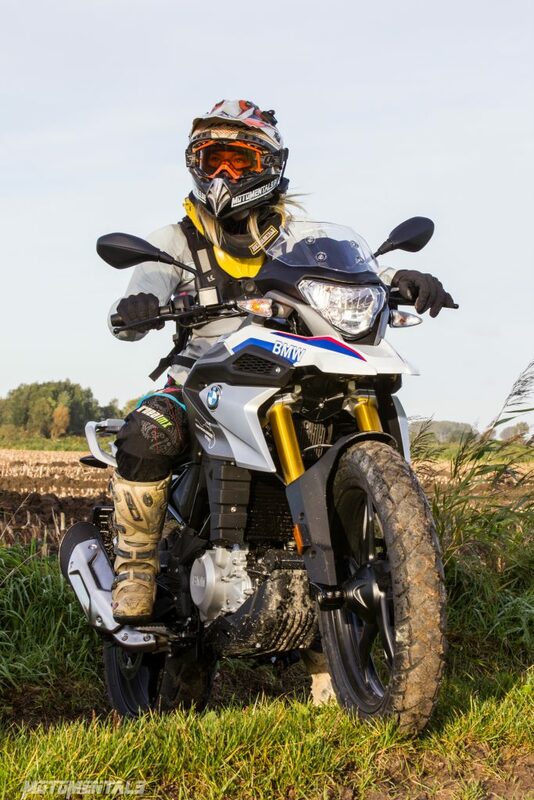 Reading the reviews of the journalists who have tested the G310GS in Spain, oh yes, I understand that they had one hell of a time in those curvy mountain roads. The suspension of the bike does the trick on road very well, yet when hitting some bumps in road it rather jumps than ride over it. 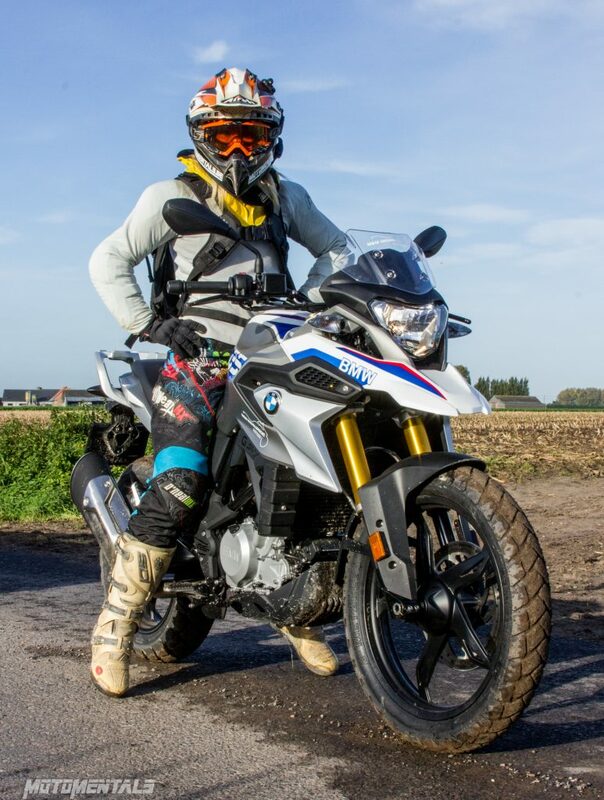 Time for me to get this one off the pavement, when crossing the border back into Belgium I follow some of my tracks at first too nervous because I don’t want to drop the new bike. Setting the ABS off is an easy trick to do, push the ABS button till the light on the dashboard appears and then go. Remember to press it again when you have switched off the contact, it automatically turns back on. For one of those reasons, when I was riding off road, I just used the kill switch when I had to wait or wanted to check something out. Riding a while on, I noticed I had been worrying about nothing, even with the road tires the G310GS does what it has to do on light off road trails. Gravel is absolutely no problem, I quickly rode as fast with this one as with my own GS. It actually did better because of the upside down fork and, yes I have to admit, the lower weight. Gas response is good, it isn’t too light so you’re always in control even when you hit some unexpected bumps. As well is the engine smoothness, it picks up slowly in the lower rpm but when you get to the midrange it climbs up to 9.000 rpm remarkably faster. In first gear it’s pretty slow but not slow enough to tackle on really technical trials riding in idle. You have to take some clutch and brakes along to get it under 11km/h or 7 miles/h. Saying that, I’m obliged to mention that the engine stalled on me a couple of times when testing the slow riding. Next up was the more dirtier, mud and sand, section of my track and I hesitated to go fast on it at first. Yet, the rule ‘throttle it out’ still applies for this one too. I was able to correct all the movements of the motorcycle with only shifting my body weight, throttle in a different way or some gentle pulls to the steer and to be honest, it didn’t need much correction even with the road tires. Talking about brakes, the calipers on the single disc in the front and back have more than enough power to get this motorcycle to a stop. The front is even very sensitive so you can actually gently use it to slow the bike down off pavement. Generating an overall verdict about this bike is pretty easy. Keeping in mind how BMW advertises this motorcycle as a fun bike for city traffic, country roads and some light off roading, yes they have succeeded in their intention. 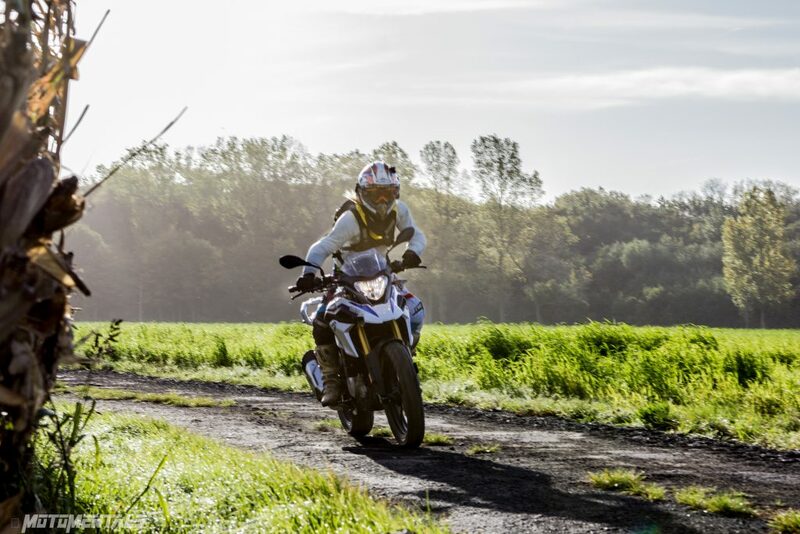 I had great fun in traffic, when I realized how I had to ride the bike, I had the biggest grin on my face in the winding country roads and an aspect that I did not expect, the bike was freakishly easy on the off-road trails that I know in my environment. In addition to my riding experience, I asked in several social media groups. What would you like to know about this motorcycle or is there anything that you want to ask me about it? Here are the most frequently asked questions and my answer. If you were to buy one, what would you change immediately and what on long term? I’d immediately go for a set of huge risers, enduro foot pegs, adjust the clutch lever position, change to a different set of mirrors because the right one is mounted on top of the holder of the brake fluid cup, a set of offroad tires Pirelli scorpion rally and get the seat remodeled because there is an edge that hurts the inside of my knees when standing up and gripping the bike tightly between my legs, when riding onroad it doesn’t bother me. On the longer term I’d definitely buy an aftermarket exhaust and spoked rims. Might want to get rid of the luggage rack in the back if I’d use it only for offroad rides and not start traveling with it. And if I had an unlimited budget I’d go with a suspension upgrade, a bigger windscreen and heated grips. 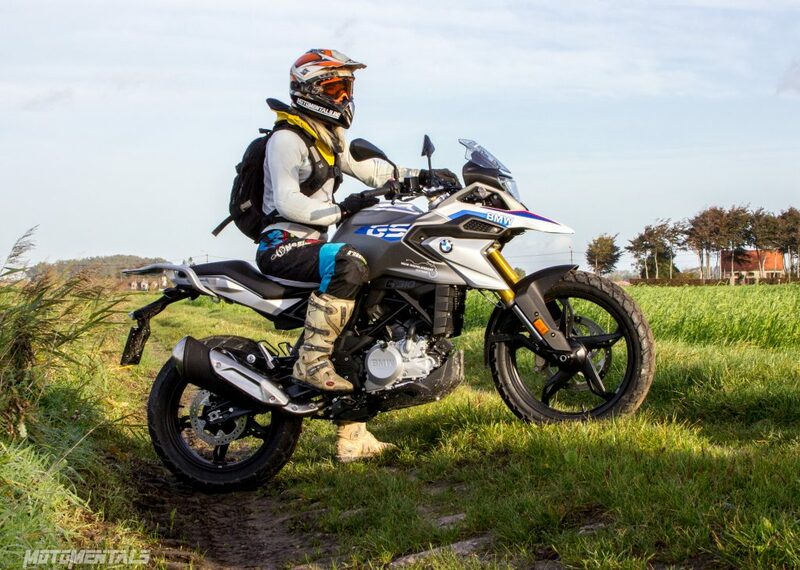 Does the standard G310GS have offroad potential? Yes but in my opinion, all bikes can ride on gravel even sports bikes and choppers, it’s just the quality of riding and fun that will differ. So I’m changing the question into ‘Will I have fun taking it offroad?’ and that is a definite yes. 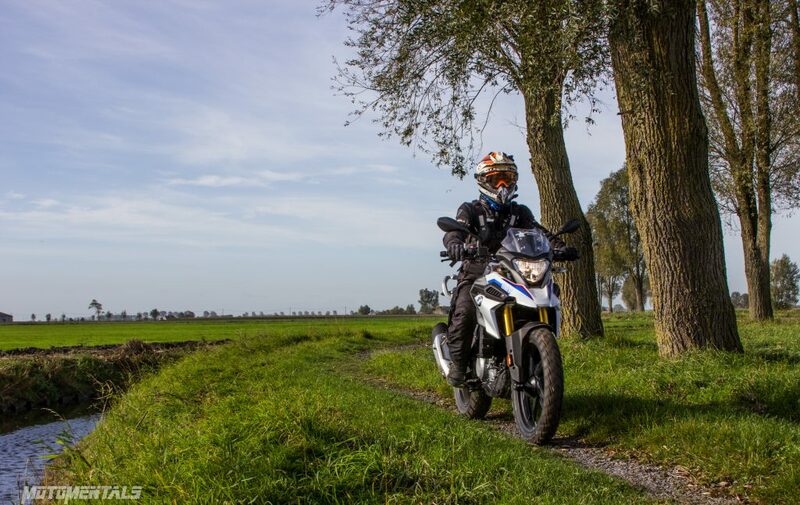 The G310GS is capable of riding soft occasional offroad in its standard version. However the fun factor will only increase with the following minor adjustments; a set of risers, the handlebars are ridiculously low even for onroad riding, get those slippery rubber thingies out of the pegs and tilt the handlebars a little forward, your wrists will thank you. These basic adjustments do wonders for the GS and made me feel more comfortable. The ground clearance is 24cm. If you’re seeking a small displacement bike for serious mud work, I’m recommending a new seat or get the seat remodeled, with my stature my knees are just on the same height as a sharp edge of the seat and it just irritates the inside of my knees even during these short 30 km offroad rides standing up. It might sort out itself when mounting bigger enduro foot pegs so your legs have a little bit more room. 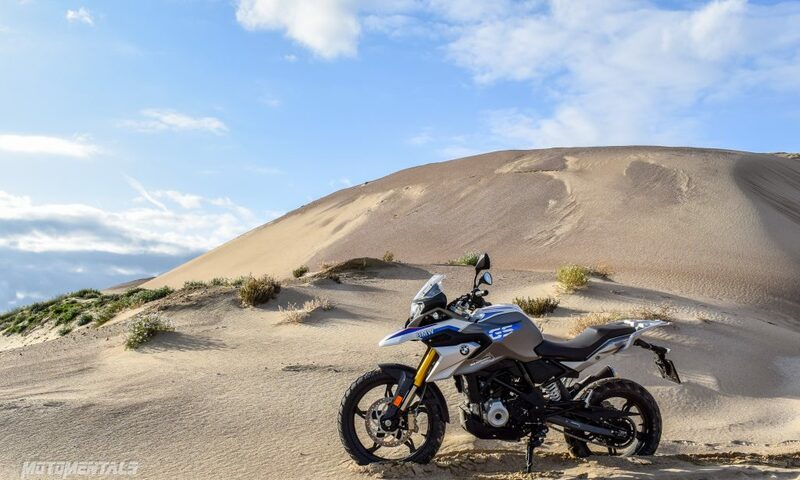 The motorcycle does not feature spoke rims and that is one of the comments I’ve heard most about it online, the sturdiness of the aluminum rims in offroad will have to be tested by riders in the world taking the G310GS off the beaten path. For who is interested in mounting new shiny spokes, awesome people around the world are already busy manufacturing them. In the U.K. John Mitchinson from Rally Raid has already the hubs available and will bring a front spoked wheel of 19” with original width (2,5) and a rear spoked wheel of 17” with a narrower width of 3,5 instead of the original 4,0 to the market. When I asked John why already had the CNC hubs available when the G310GS is so new, his answer was simple but true; “There is a market for them and just because I can!” Meanwhile Woody from Woody’s Wheel Works in the U.S.A. is also working on manufacturing the hubs and spoked wheels. Tell us about the seat height. When I first heard about this ‘Baby’ GS as some of the press prefer to call it, I figured BMW would have produced a really small GS. The mini version of the iconic boxer for smaller riders or those new to the field who want to learn fast and effectively. Well, you can forget about that. 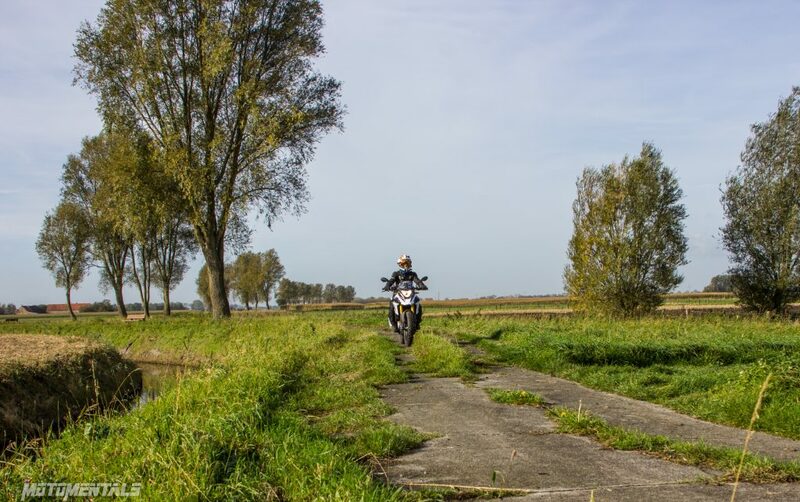 The G310GS is a still an allroad motorcycle and I was shocked by the 83,5 cm seat height, a 313 cc motorcycle and I still can’t touch the ground with my both feet. Only getting the big toe of both my feet on the ground at the same time. Bye to my initial thought it seemed. 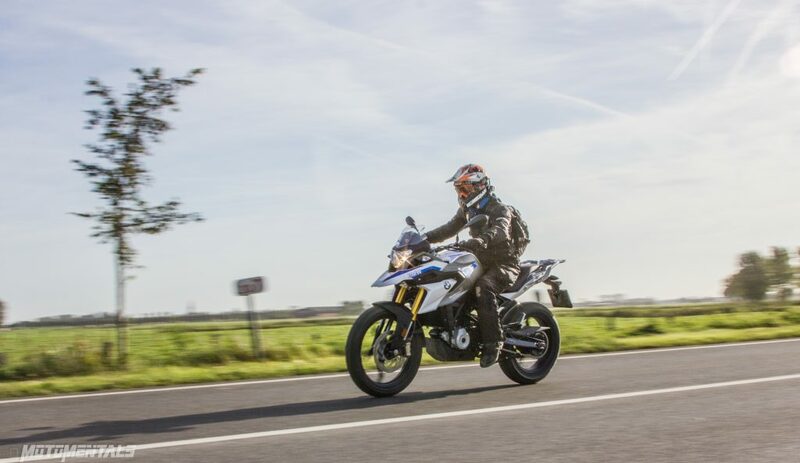 But I did not have to worry, to me the G310GS is so agile and light weight the only times that I had to come to a complete stop is when I wanted to park it or got stuck in front of a red light. In all other conditions you can squeeze this thing through every small gap that you can find in traffic and in serious off road you should be standing on the pegs till you drop it or have to make a coordinated stop. The latter leads to the question, can you pick up this bike easily? I can and it wasn’t difficult. I even tried laying the bike down in different positions and angles. 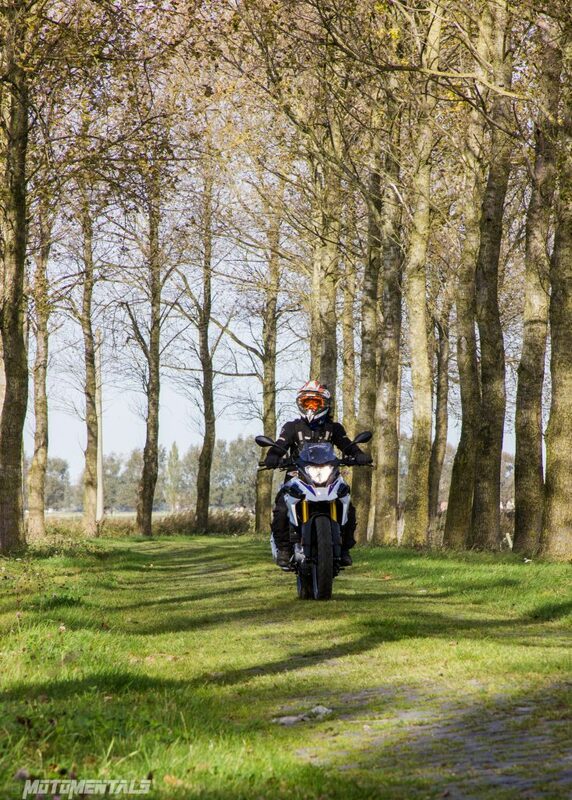 How much time does one need to gently lay down, strike a pose and pick up a G310GS? Sixteen seconds. General questions about the motorcycle itself. Fuel consumption : 8,13 l at 228,7 km è 3,5 l at 100 km tested, keep in mind that this was not gently ‘touring’ the bike. 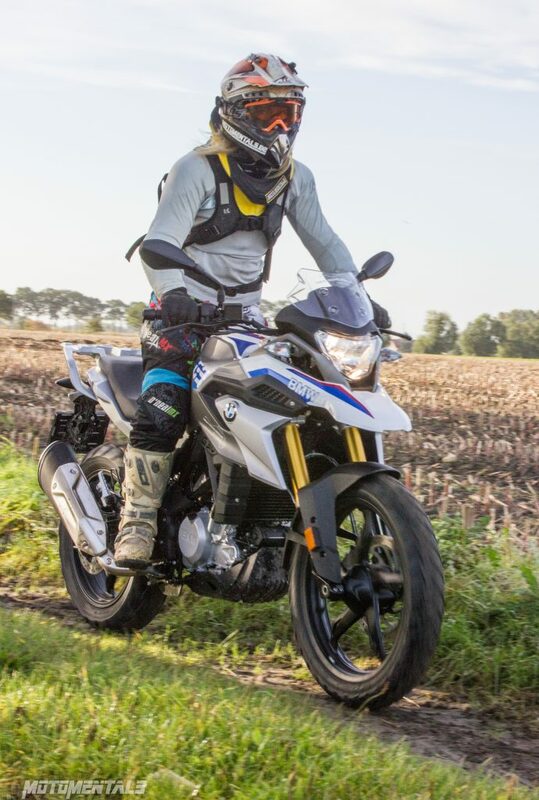 I hope you had a good read about this G310GS and as always, the only way to get to know a motorcycle, is not by reading about it but by riding it. If you’re interested in this newest member of the GS-pack, arrange yourself a test ride and find out. Riding pictures by Bart Vandewalle. A big thank you to M&M Inghelbrecht to make this ride report possible.